Top 3 winners in 101 categories giving you more than 300 winners. It's your go-guide to summer fun. Thousands voted in 101 categories of favorite Northern Michigan places, people and things. Discover who won! They’re married, they’re Native American and they commercial fish together for a living. Spend a day on the water with Ed and Cindy John. Set up at the tip of Old Mission Peninsula, at the height of summer in a sweet lighthouse? Kathy Belden knows a bucket-list item when she sees one. This TC doc’s malaria research has saved tens of thousands of children’s lives. She’s not done yet. Stephen Brede paddled around every single one of North America’s Great Lakes. He shares thoughts and photos from the epic journey. Hang out with Hemingway’s spirit; where to buy (almost) everything in camo; he wants to be king of jerky; advice for sending kids to camp, more. So much light in June! Use it to find a great event. Red Hot Best travel ideas. Start roaming! For her, all stars lead to Northern Michigan. Top 10 whitefish winners from the Red Hot Best voting! Tried and true classics for your summer grill. Folgarelli recipes for New York Antipasto and Fiora Pasta Salad. An early look at new wine releases from Leelanau. He learned to sail on Little Traverse Bay and now is sailing America’s Cup. Meet Matt Cassidy. Let’s hear it for summer! Anniversaries are funny around here. 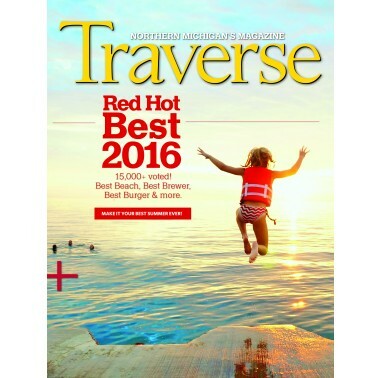 Last year’s June 2015 issue of Traverse, Northern Michigan’s Magazine was our 36th June issue. But as many people mention to me, by normal calculations, this issue marks our official 35th anniversary of waking up every day to celebrate and protect Northern Michigan.